The Shangri-la Hotel, Chiang Mai organized the 1st Corporate Social Responsibility (CSR) Fun(d) Fair 2010 on February 26.. Guests and hotel staff joined the friendly local market style garage sale and contributed to this CSR activity by purchasing the goods being sold at the fair. The fair raised 43,600 baht which will be donated to the Baan Kor Sariem School at Sankampaeng district and is part of the long term project commitment of Shangri-la Hotel, Chiang Mai. 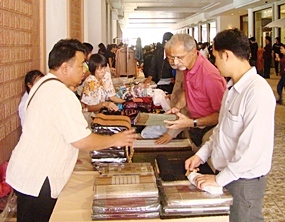 The Shangri La Hotel recently held a garage sale style fair at the hotel to raise funds for Baan Kor Sariem School. The goals of this project are to improve the quality of education and the lives of students by providing them with the necessary facilities. The first year of the project will see the renovation of the school’s under maintained buildings, electrical system and improve the facilities that are way below standards both necessary and beneficial to the students and school. As for the longer term, students with high potential who graduate from Baan Kor Sariem will be given the opportunity to train with the hotel. Skills gained at this training can be used for further employments or education which is all aimed for them to be able to support themselves and their families. If the students’ credentials meet the required criteria, they might be given the chance to become a member of the Shangri-La family. Thailand is continuing to offer insurance coverage worth $10,000 to anyone harmed in riots and demonstrations as it seeks to attract tourists scared off by political turmoil, officials say. Other carrots range from a waiver on all visa fees to discounts on airline landing fees. “The measures are to support the tourism industry. The situation has been recovering but the businesses still need help,” said Thai government spokesman Panitan Wattanayagorn earlier this week. Thailand has been plagued by political conflict since the ouster of Prime Minister Thaksin Shinawatra in a 2006 military coup. More demonstrations are scheduled by his supporters for mid-March. In 2009, the number of tourists dropped to 14.1 million, an 8 percent decrease from the previous year while revenue shrank to 527 billion baht ($16 billion), a 3 percent drop from 2008. Tourism is the country’s number one foreign currency earner. The free insurance coverage, along with other tourism stimulus measures, was initially put in place after the seizure of Bangkok’s two airports in late 2008. Hundreds of thousands of tourists were stranded in the country. Tourism and Sports Ministry spokesman Vachara Kannikar said the $10,000 coverage has been extended until the end of the year and applies to any foreign visitor who experiences loss or damage from political upheavals, including death, injury or disability. Victims will also receive free medical treatment and a daily $1,000 in compensation if hospitalized for more than 10 days. Tourists who face travel delays because of riots or demonstrations will be given $100 per day. But this amount and the hospital stay cannot exceed a total of $10,000. Airlines will enjoy a 10 percent discount for parking fees and a 20 percent drop for landing fees through the end of 2010, Vachara said. Electricity bills for hotels are also being discounted. A recent slightly messy lunch caused me to stop and ponder the ubiquitous little pink tissues that dot every Thai restaurant and some farang ones too. Why so tiny? Why so pink? My sister came to visit and said she thinks Thai people have paper products issues, from the little pink tissues to the lack of toilet paper. I had to laugh but then, when trying to wipe my messy hands and needing about a dozen or so to do so, I thought perhaps she wasn’t so far off the mark after all. A really interesting book that professes to cover all these burning issues (and more!) is called Very Thai by Phillip Cornwel-Smith. The book has been around for a few years, and, assuming he’s got his research right, is an invaluable resource for those people who find the little things in life in Thailand so interesting. If the questions of why the big hair for weddings, beauty pageants and Khunyings, why the sniff kiss, and why does everybody have a nickname keep you awake at night then you really need to read this book. There are many aspects of life in Thailand that cause all of us expats pause for thought. Sometimes they are big things (why so much paperwork at Immigration? Why do they need copies of every little thing?) Sometimes spiritual (who are the little dolls inside spirit houses? ), and sometimes just completely inane (pink tissues). But we’ve all asked these questions and pondered our own reasons for the things we see and don’t always understand. I’ve found that the key to living in Thailand with some kind of equanimity is the understanding that things are done differently here. That it’s ok that things are done differently and that just because I don’t understand does not mean that it’s not understandable. I always wondered why kids would take the mufflers off their bikes (I figured they liked the noise) but have been told that it’s a widespread belief that the bike goes faster if it doesn’t have a muffler. It certainly sounds faster so I guess that would make sense that someone would think that. Thai nicknames often cause confusion, Lek is so popular you have to ask someone, “Which Lek do you mean?” when discussing someone. Well, I have heard more than a few reasons but one is that the old belief that demons would not be able to find your child if they didn’t know their real name. While the superstition itself may be passing into folklore, the tradition remains. Sometimes the names make sense, Lek can be the youngest or the smallest child, Dum is often a dark skinned child and I have a friend named Bet (duck), she told me that when she was a baby her cry sounded like a duck. I know a man named Keo (green) I don’t think I want to know how he got that name. Life in Thailand is often exasperating, sometimes difficult and challenging, but never boring. And for that, I am grateful. Oh, and the paper products issue? Well, my sister wasn’t so far off the truth,. According to the book, the reuse of napkins is considered dirty, one use and then throw it away seems to be the concept behind the tiny tissue. If you intend to plant trees in a new land, you need to know the capacity of your soil. A good way to learn this is to see what the neighbours grow. Their advice can often spare you time and money. You also need to make sure how good your water supply and drainage is. Again, talking to neighbours is good, because one year’s experience is not enough. Secondly, you need to know the scientific names of your desired plants, as that information will enable you to read more about each plant’s requirements. It is always better to plant a young healthy plant, which will grow quickly, rather than buying an expensive half dead giant, which may die due to fungal infections and dried tissues after 3-4 years.